No, the title of this post does not refer to the Rahul Bose movie, though it could have and that post might have been more interesting to read than this one (am nothing if not honest! ). This post is about us Indians and our health related attitudes, beliefs and behaviour. Over the last few years, there’s been enough coverage in mass media about the rapid growth in prevalence of lifestyle-oriented ailments & conditions in India, due to which awareness levels of diabetes, cardiac problems, etc. amongst the general population has undoubtedly increased. Ask anyone to tell you the health problems they are worried about getting in the future and these will invariably be mentioned. One friend swims regularly; not only does she watch her own weight, she is conscious of her friends’ weight too and serves only healthy snacks to friends that visit her home – such as home-made soup or salad, or dry fruits. Another friend has chosen to give up sugar completely – not even in tea or coffee! Etc. etc. you get the drift, don’t you? All of them worried about looking good and staying fit over the long term. So then why is this post titled ‘Everybody Says I’m Fine’? Well, these friends are literally the exceptions that prove the rule, they constitute the sliver of the population that is very conscious about health and makes an extra effort to stay in good shape. In research after research, whether in focus groups or depth interviews, we’ve noticed that almost all respondents describe themselves as healthy, rarely entertaining any self-doubt on the issue. Even respondents that are visibly unhealthy, often mentioning an ailment, for instance, people with knee and joint pain, that struggle to walk, will describe themselves as healthy. Published quantitative surveys, such as this one by Technopak, throw up the same output. 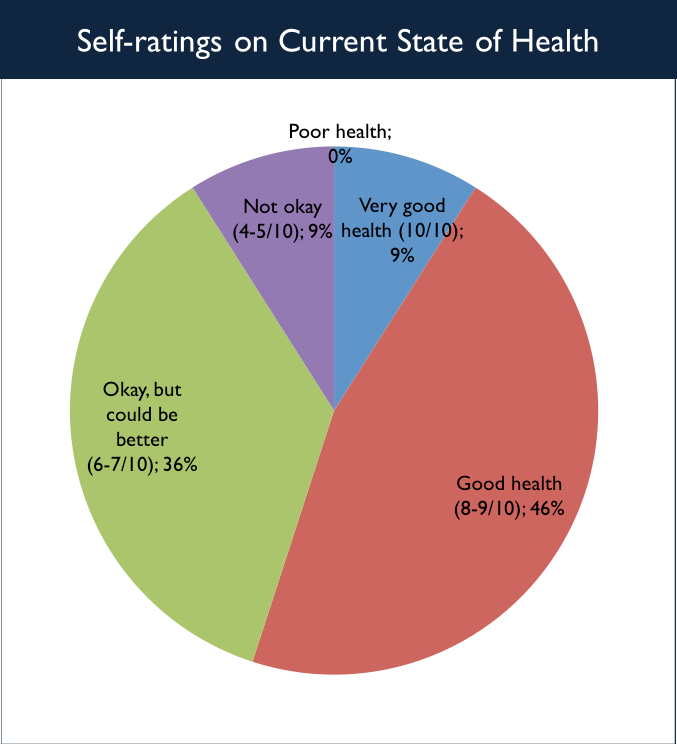 Most respondents rate themselves as having excellent/ good health – in fact, 56% give a score of good / very good health! To truly appreciate this paradox, do pause and spend a few seconds thinking over whether 50% of the people you see everyday are in good or very good health. As usual, India turns out to be the land where seeming paradoxes co-exist. There’s a portion of the population that is very conscious about health and fitness, and there’s a chunk that seems to be quite unconcerned though they are aware of and worried about chronic ailments such as diabetes and heart problems in the long term. Which of these segments can a healthcare marketer look to for sales? And what will the potential market size be? What is the benefit that will appeal to these segments? Which products will sell? Are there products that sell well abroad but will not do that well in India? How do different segments define ‘good health’? How do they define ill-health? What are the health issues that do worry consumers? Are these the same across countries? How can companies and health-focused organisations raise awareness about health issues? How long does it take to educate consumers and change their habits? Complex questions all, with finely nuanced answers. I’m afraid you will have to call or email us for the answers to these; these require a conversation and cannot be fitted into blog posts. Do write in to us or comment below to tell us what you think about your health? How healthy are you? What do you do to stay in good health? 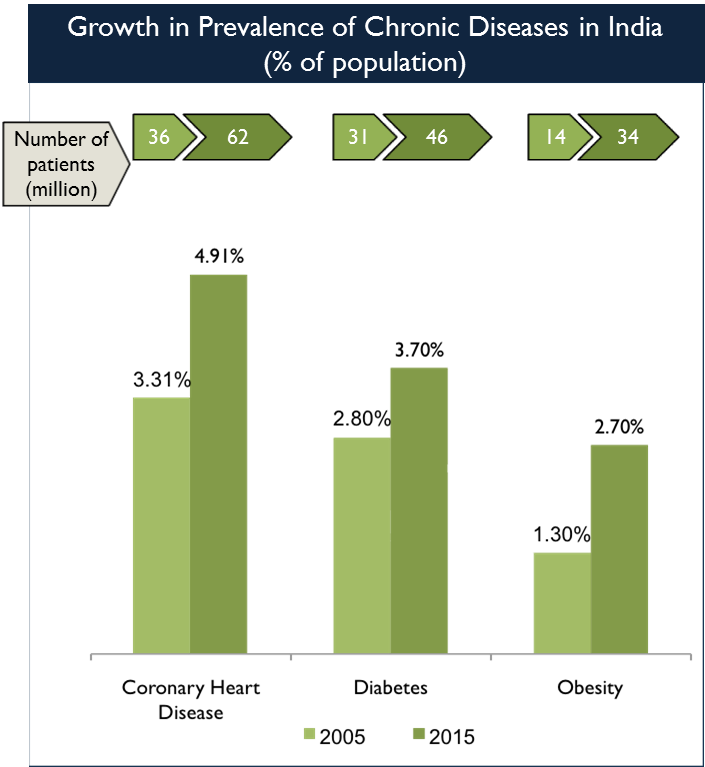 Entry filed under: Health & Wellness, Healthcare, India Stats, Observations. Tags: anecdotes, Chronic diseases, consumer perception, growth rate, rating. Updates	Almost an Adult ! I think you’re absolutely fit too Zen. Nike, that’s why I like my friends – they encourage my little delusions. Howdy! I simply want to offer you a big thumbs up for your excellent info you’ve got here on this post. I am returning to your blog for more soon. Just read your comment – what a pleasant thing to read first thing in the morning (that’s the time here in India). Glad you liked the post and do read more and more of our posts. Hope to see more comments from you. if so after that you will definitely get good know-how. I’m attempting to find things to improve my web site!I suppose its ok to use a few of your ideas!! Sure, do go ahead and use a few of our ideas.